Wow! It’s been a wild ride already on AdoreTour2017. For those of you who followed our tour last year, you’ll remember that week one of that trip our motorhome broke down in the desert of New Mexico and had to have a new transmission put in. While the transmission was being replaced we drove our little Kia Soul tow car to our Texas gigs , where it broke down before we could travel back to retrieve the rv! Who would think anything like that would happen again?! Well, yesterday we pulled out of Murrieta, CA to embark on our 9 month tour and made it one hour down the road before loud clanging erupted in the motorhome’s engine. 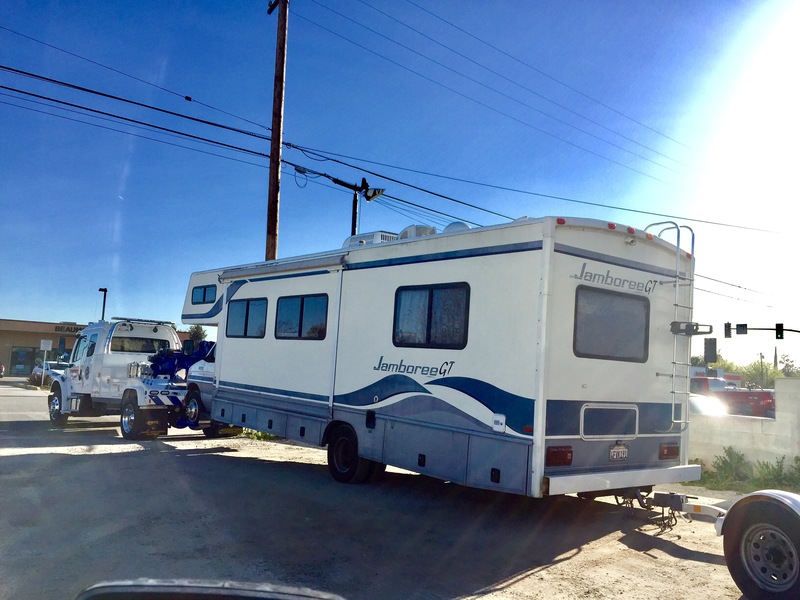 We wound up at a small RV dealership in Banning, CA where a kind salesman helped us get the rv towed to a shop. He used his personal AAA to have us towed for free! We spent the night in the parking lot of the rv repair shop and this morning they let us know we need a new engine in the rv. Ugh! It will take them 3-4 weeks to do the work-but thankfully the quote they gave us was a third less than all the other shops quoted. We are missing our home on wheels but we’ll enjoy these precious days with our Arizona friends! We’ll see you soon Big Rigg!